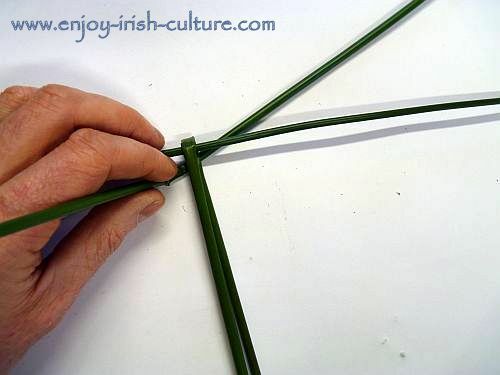 Making a Brigid's Cross is an Irish crafts tradition associated with Brigids Day, February 1st. 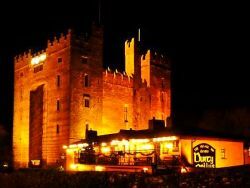 This day is considered the first day of spring in Ireland. Scroll down to find all the instructions you need. 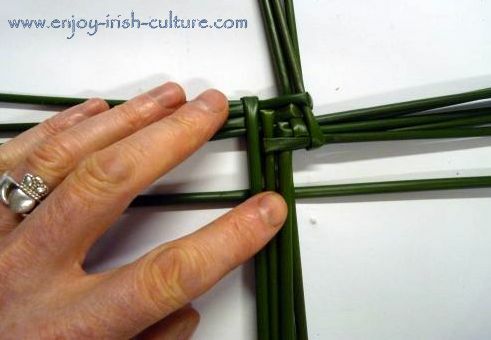 It is the Catholic Feast Day of Saint Brigid. 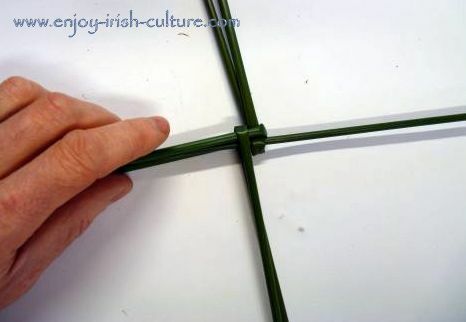 Legend has it that Brigid wove a cross like this one from rushes to demonstrate to a dying pagan what Christianity was all about. 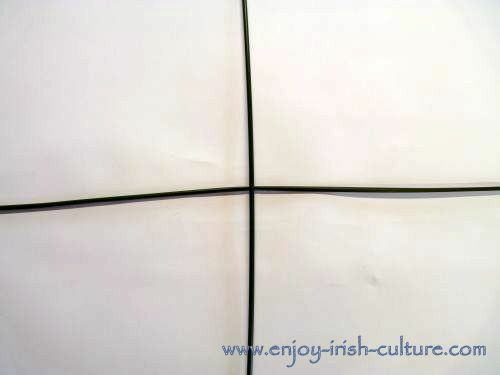 In Ireland the cross is seen as a sign of welcome for visitors to the house as well as protection for the residents. 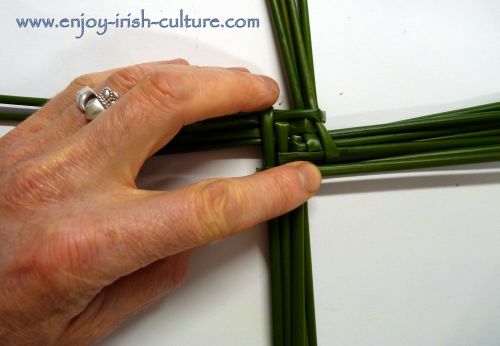 Join us in the studio to make a Brigid's Cross. 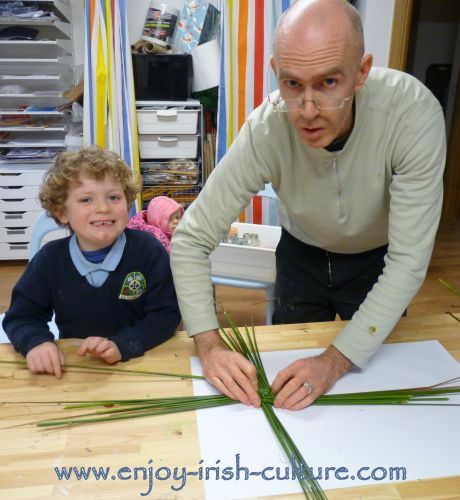 Colm and Cillian are starting it off, and Tara is watching, too! The first step is to go outside and collect a bunch of rushes. 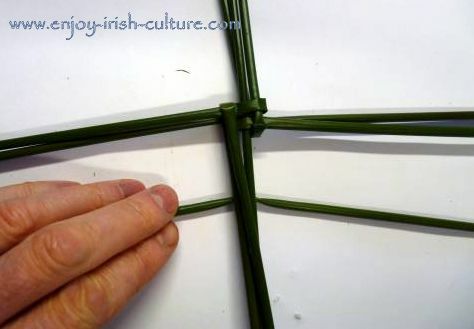 Rushes are the original material used to make a Brigid's Cross. 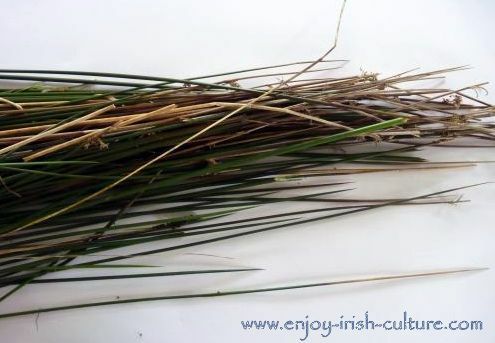 Rushes are plentiful in Ireland, especially here in the West where the soil is largely quite poor. 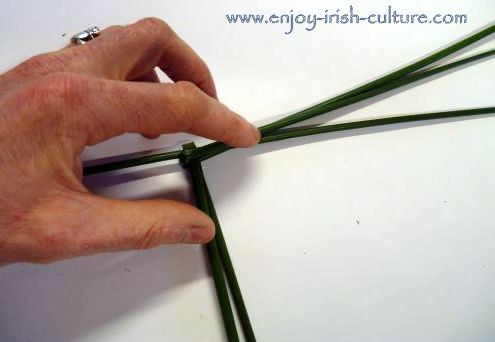 If, for any reason, you cannot get hold of rushes, you can use reeds instead, or even straw. If these are dry and brittle, make sure to soak them for a couple of hours before you start. 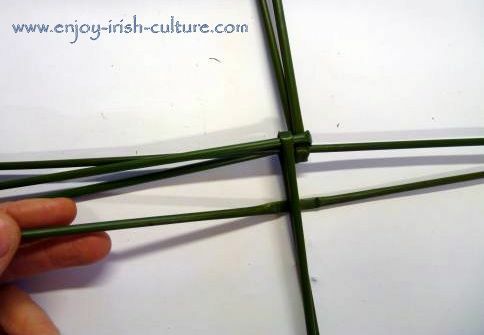 Now pick the first two rushes and lay them down on the table making a cross as seen above on the right. Now take hold of the vertical rush and fold the top down OVER the horizontal rush. 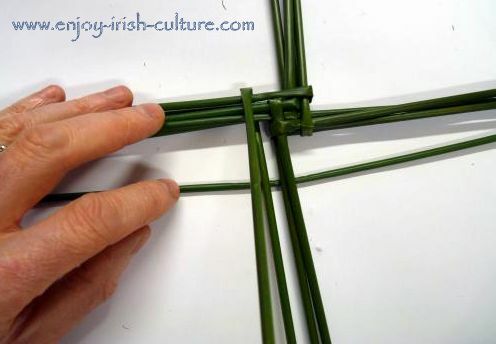 Then pick a third rush, and insert it underneath the piece you have folded down. It should lie parallel to the horizontal single strand. 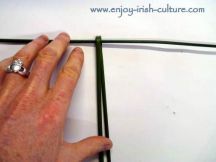 Left: This last rush that you have just inserted is now folded in half towards the right OVER the two strands at the bottom. 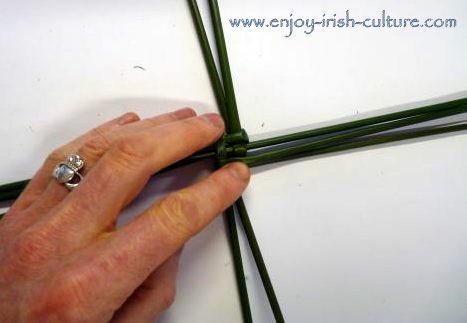 Make sure it sits neatly there on the fold. Right: Then turn your assemblage CLOCKWISE by one quarter. 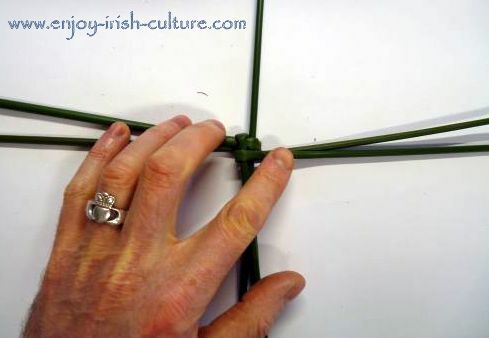 Left: Insert another rush at the bottom, placing it underneath the strands that point to the bottom first, then fold it over those strands towards the right, folding the rush in half. Right: Turn your creation CLOCKWISE by one quarter. 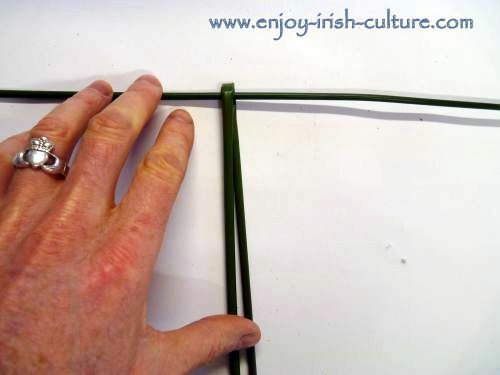 Left: Exactly as you did before, insert a rush laying it underneath the strands pointing towards the bottom. 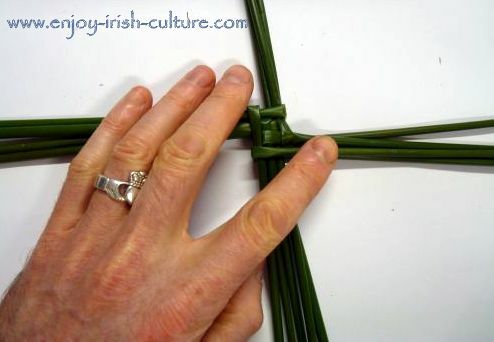 Right: Fold it in half towards the right making sure it sits neatly against the centre piece. when you are done, turn the assemblage...you've guessed it...CLOCKWISE by one quarter. 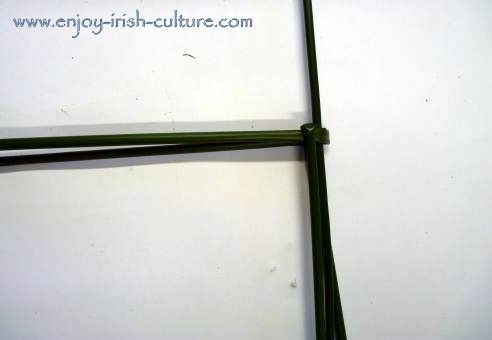 Left: Insert a rush underneath the two strands that protrude at the bottom. 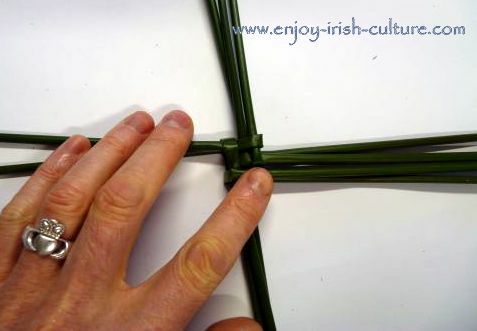 Right: Fold the rush in half OVER those strands holding so that it sits neatly against the centre of the cross. When you are done, turn your piece CLOCKWISE by one quarter. Left: here we go again. Insert rush underneath. Right: Fold over towards the right, then rotate clockwise by a quarter. Easy-peasy at this stage. 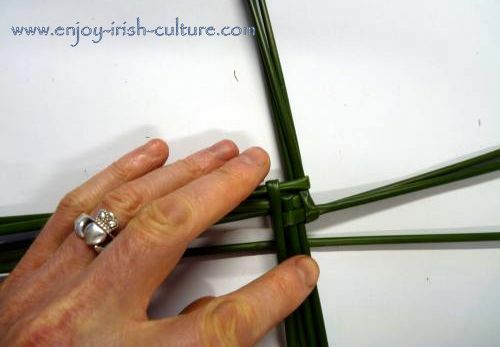 The tricky bit now is to hold the centre down onto the table neatly so that the nice weave you are creating stays neat. 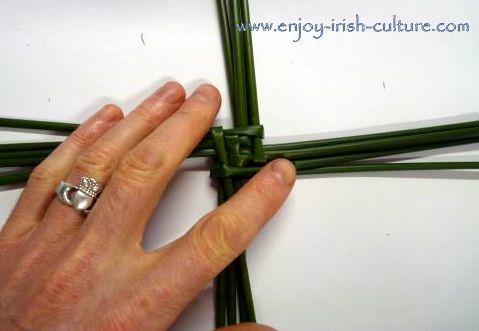 Now you are more than half way there making your Brigid's Cross. Join us here to continue and finish it off using only rushes, no man-made materials! Hi there, like what you see on our website? If you do why not tell the world about us?! It will help other people like you to find and enjoy our content, too. We'd appreciate your support and have provided some convenient social buttons both at the top left and at the very bottom of the page.